Alexander MacLeod was born in Inverness, Cape Breton and raised in Windsor, Ontario. His bestselling fiction debut (Light Lifting, Biblioasis 2010), released last year in the UK, was an ALA Notable Book for 2012, shortlisted for the Frank O’Connor Award, and the winner of an Atlantic Book Award. 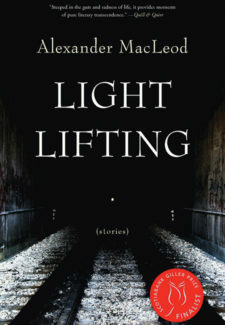 Light Lifting was also shortlisted for the Giller Prize and the Commonwealth Prize. Alexander holds degrees from the University of Windsor, the University of Notre Dame, and McGill; he currently lives in Dartmouth, Nova Scotia and teaches at Saint Mary’s University in Halifax.